Destroyed in AD 79 by the same eruption of Mt. Vesuvius that engulfed Pompeii, Herculaneum was buried in molten lava, instead of the ash that covered Pompeii. The town of about 6,000 people lay for centuries encased in a solid mass of pumice and ash to a depth of 12 to 30 meters. This hard, deep covering formed an airtight seal that protected it from plunderers and even from early excavation methods, saving artifacts and priceless details that have been lost at Pompeii. And unlike Pompeii, all but the very first finds and artworks have been left in their original places, not stripped for transport to off-site museums. In addition, instead of a sudden weight of falling ash that crushed roofs and collapsed houses in Pompeii, the fast-flowing lava filled Herculaneum from the ground up, supporting walls and roofs as it encased them. This preserved its multi-storied homes, complete with doors and staircases, as well as a wealth of organic material missing in Pompeii. Wooden furniture, textiles, and even foods and skeletons tell us much about everyday life here, and its vivid frescoes and mosaics remain intact. For these reasons, and because the site is smaller, less crowded, and the attractions are easier to explore, many tourists find Herculaneum more interesting than Pompeii. The two ancient cities can be combined on a day tour from Naples, or Herculaneum is easily reached on a half-day trip from Sorrento. At the south end of Cardo III, which runs through an area excavated in the 19th century, Casa dell'Albergo filled almost an entire block. From the lines of columns that were once in its atrium, you can get a sense of the original size of this patrician house that was made into an inn. Facing it on the other side of the street are the House of Aristides, a sumptuous country villa, and the House of Argus, with wall paintings and a garden with pillars. Farther along on the left is the House of the Genius, a fine patrician mansion with a garden enclosed by colonnades. Beyond the inn is the House of the Skeleton, with both wall paintings and mosaics. Halfway along Cardo III, the street is crossed by the Decumanus Inferior, beyond which is the House of Galba, on the left. Another fine patrician mansion, this one is interesting for its peristyle, which has a pool in the shape of a cross. It might have been a reservoir, an ornamental fish pond, or intended for bathing, but it is unique in its shape. The area's original Doric columns were later covered in stucco. Beyond this house are more residences that are still unexcavated. On the opposite side of Cardo III, at the end, the Sacello degli Augustali is a very large square shrine lit by an opening in the roof. 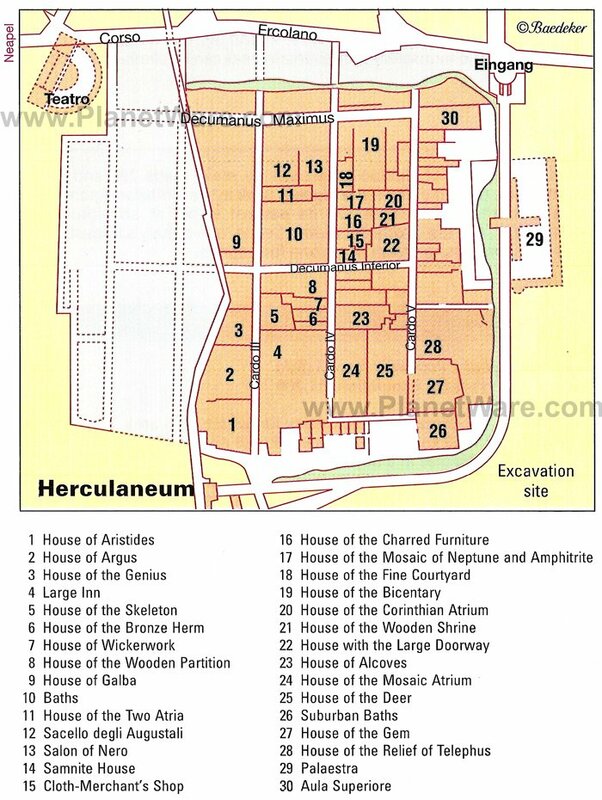 It was originally dedicated to Hercules, patron of Herculaneum, but later consecrated to the Imperial cult. It has excellent frescoes, especially the one showing Hercules in Olympus with Juno and Minerva. Another shows Hercules fighting an Etruscan god. The Augustali were freed slaves. Among the more recent excavations along the Decumanus Inferior, on the left, are the well-preserved thermal baths, with separate sections for men and women. The men's domed frigidarium has a floor mosaic of dolphins, and the women's tepidarium floor, also in excellent condition, has a geometric pattern. Some of the wooden shelves are intact, as well. Opposite the baths, across the Decumanus Inferior is the Cloth-Merchant's Shop, with a restored wooden press. At the corner of the Decumanus Inferior and Cardo IV is the Samnite House, one of the oldest patrician mansions in the town - about 300 years old at the time of the eruption. The atrium has a gallery with Ionic columns, and throughout the house are rich stucco and fresco decoration. Be sure to look up to see the delicately carved tufa capitals. Diagonally across from it is the House of the Wooden Partition, a patrician house of Samnite type but without a peristyle or colonnaded court. The bedrooms still contain bedsteads and a wooden chest. The adjoining Casa a Graticcio was a more modest house with interior walls of wattle. Farther up Cardo IV, on the other side of Decumanus Inferior, past the House of the Charred Furniture, is the House of the Mosaic of Neptune and Amphitrite. It is named for the well-preserved glass wall mosaic of Neptune and Amphitrite, one of a number of beautiful mosaics here. On an adjoining wall, the nymphaeum is also covered with a glass mosaic, with marble masks above it. On the Decumanus Maximus, which parallels the Decumanus Inferior on the north and is still only partly excavated, the House of the Bicentenary contains one of Herculaneum's most fascinating mysteries. Stucco on a wall shows clear evidence of having once held a wooden Christian cross. As St. Paul is known to have preached nearby, it is thought that this might have been a meeting place for early converts. If so, it may be the oldest known Christian cross. The house derives its name from the fact that it was uncovered in 1938, 200 years after excavations were started. At the end of the Decumanus Maximus, Cardo V leads back past a series of shops, including a weaver's with looms, a dye shop with dye pots, and a bakery, in whose yard are ovens and mills for grinding grains. Behind these, the large area was the Palaestra, a public field for games and other events. At the southern end of Cardo V, the House of the Deer was another luxury villa, with two stories built around a central courtyard. Notice especially its marble-chip and mosaic floors and frescoed walls. In the large garden, marble tables and deer statues were found, which are now preserved in the on-site museum. Next to it is the House of the Mosaic Atrium, a spacious home with an unusual room divided into three naves, like a cathedral, the only one of its kind found here. Opposite the House of the Deer, the House of the Relief of Telephus is one of the most elegant mansions in Herculaneum. In its spacious colonnaded atrium is a marble basin and a colonnade leading into the park, which sloped down to the marina. The columns in the atrium support the upper floor of the three-story house. The original marble masks that hung between the columns have been replaced by cast replicas. The house is named for the marble relief, a finely worked piece in excellent condition. At the edge of town near the ancient beach, the Suburban Baths are among the best preserved. Smaller than the central baths, they do not have twin facilities for men and women, so were either co-ed or used at different times. The slate, mosaic, and marble floors; wall frescoes; and fountains are in good condition, although you can see some damage that was done by the force of the lava pouring in through the window. The House of the Gem, next to the baths, is beautifully painted in reddish-brown tones. It was long believed that unlike Pompeii, Herculaneum's residents had escaped, as few human remains were evident in the town. But in 1982, further excavations at the port uncovered the skeletons of 300 people who had fled the city only to be incinerated by the sudden blast of extreme heat. Villa Signorini Events & Hotel: 4-star hotel, 18th-century villa, old-world charm, beautiful gardens, seasonal hot tub. Andris Hotel: mid-range pricing, Mount Vesuvius views, peaceful location, spacious rooms. Il Sentiero: 3-star hotel, sea and Mount Vesuvius views, rooftop sundeck, free breakfast. Hotel Herculaneum: budget-friendly hotel, opposite the ruins, helpful staff, excellent free breakfast, family rooms. Tours of Herculaneum: A four-hour Herculaneum Tour from Sorrento provides round-trip transport by air-conditioned coach from your hotel in Sorrento and a tour of the ancient city led by an expert local guide. The two ancient cities can be combined on an eight-hour Pompeii and Herculaneum Day Trip from Naples, which includes round-trip transportation, a guided tour of Pompeii, a typical Italian lunch, and plenty of time to explore Herculaneum. For Your Comfort: Although there are quite a number of houses and other buildings to see in Herculaneum, these are much closer together than at Pompeii. Even so, expect a lot of walking on rough surfaces. Comfortable shoes are highly recommended. You'll find luggage storage at the ticket office. Getting There on Your Own: The Circumvesuviana trains connect Naples and Sorrento, with two stops in Herculaneum. The Ercolano Scavi stop is a 10-minute walk from the entrance to the excavated area. There are shuttle buses, but unless there is a bus just loading it's usually faster to walk.